ONCE and future journalist David Fox's exploration of business options has culminated in his co-founding of Nashville media startup dubbed Exile Global Inc. The company's inaugural iOS mobile news product -- the brand, itself, has not been disclosed -- will provide a stream of precis summaries or "aggregation" of worthwhile news items from credible sources, each taking "10 to 30 seconds" for readers to consume, Fox told Venture Nashville. The first news-aggregation offering will be market-ready within six months and will be entirely supported by ad revenue. It will target the company's priority demographic of U.S. users in the age 13 to 30 cohort, as well as advertisers who need to reach those users, Fox said. Fox is CEO of the company, which he created with Noah Rawlings, the company's 22-year-old chief product officer and content strategist. The startup was registered May 31. Rawlings had a company with a similar name as early as 2012, VNC research shows. "We think we've identified an enormous void in the market, that we think we can serve -- one that we can, frankly, drive a truck through," said Fox. He acknowledged that he was withholding key elements of the company's gameplan, for later release. ► First, young news-seekers have strong appetites for information globally, now that digital communications has enabled them to be plugged into threats, opportunities and other news, continually. ► Second, many of those same news-consumers do not trust older-gen news sources. Exile Global's offerings of aggregated short-form news and, eventually, original content for its expanding lines of business will be calibrated to earn trust among young users, said Fox. ► Third, the Exile Global team believes that major-brand advertisers are often misled regarding the value of their digital ad buys, because reported impressions are often distorted (by automated clickbots and other means) by outright fradulent reporting of user engagement data, and because "Millennials have simply gotten very adept at 'not seeing' much of the advertising" that is served them." Fox and Rawlings have raised an undisclosed amount of Seed-a capital from friends, family and high net-worth individuals and the team contemplates having a "clickable product" within two months and projects a Seed-b later this year. Fox said he'll also have discussions with institutional investors to determine the market's appetite. At the time of his VNC interview, the CEO said he was free to name only one of his "4 or 5" outside investors at the moment: New York native Saul Solomon, who is a member of the Klein Bussell law firm here, and who previously served 18 years in executive ranks with Bridgestone Americas. He said no single investor holds unilateral controlling interest in the company, and he and Co-founder Rawlings hold identical shares of equity. Fox said relationships with other strategic players will likely become an important part of Exile Global's business plan, but he added that he believes it is premature to focus on prospects for the company's eventual sale to a strategic or other exit options. Asked about competitors, Fox said three that came to mind were Mic.com (Mike Network), Fusion.net (Fusion Media Network, acquired in 2016 by Univision) and Shapchat Discover. "This is going to be a national an company and it's an important part of our brand that it's based here in Nashville," said Fox. Fox said he is "100 percent" dedicated to Exile Global, adding, "The happiest years of my life were when I was in the media." "The opportunity to get back into the media at this critical time, to try to establish a new brand at a time when skepticism about media is at a peak... I think this is the right time" for Exile Global, he said. He continued, saying that "the proliferation of 'fake news'" and "historically low" confidence in news media -- contrasted with rising "human desire for information and for news" -- signal a major opportunity. In 1999-2005, Fox was co-founder and founding editor of NashvillePost.com alongside Townes Duncan (long associated with VC Solidus) and Bill Carey, who moved on to establish himself as author and historian. Earlier still, he spent a short stint with Bloomberg News and nearly six years as a reporter covering Business as a reporter with The Tennessean. Now 55, Fox campaigned 14 months for Mayor of Metro Nashville-Davidson County in 2014-15, culminating in a September 2015 run-off election with now-Mayor Megan Barry. Fox said he met Rawlings during his mayoral campaign. Over time, they realized they shared strong and congruent interests, and a sense of urgency with respect to providing quick, reliable news content for the demographic segment they now prioritize. As VNC reported in 2014, Noah Rawlings and his brother Joshua once operated similarly named Exile, a media and grassroots public-affairs agency. TechExile.com and Exile.is remain registered domains by Noah Rawlings, according to WhoIs records, though they appear to be parked. Notably, the father of the two younger Rawlings sons -- Brian Rawlings -- has been with Disney and others in Music, Entertainment/Film and other roles for decades. In VNC's aforementioned 2014 item on the Rawlings family, VNC reported that Nashville entrepreneur and investor Joe Glaser (Glaser Instruments, Moontoast, etc.) was active in at least one Rawlings startup. Fox declined to comment when asked whether or not Glaser is an investor in his venture. 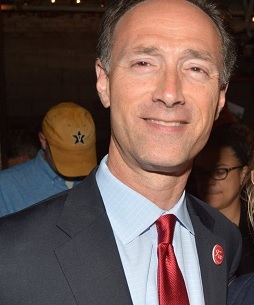 Prior to the mayoral race, Fox spent nearly nine years as co-manager and director of the Nashville office of a Stamford, Conn.-based Titan Advisors, a hedge fund operated by his elder brother, George Fox. Given his political experience, Fox knows personally what it's like to be in media crosshairs: Fox's campaign was buffeted when, a few weeks ahead of the General Election, The Tennessean reported that, unbeknownst to him, his brother was a "major donor" to Citizen Super PAC, an Austin-based conservative political action committee that made media expenditures in the Nashville market during the mayoral campaign, to boost Fox's candidacy. Exile Global's advisors include Nashville attorneys Derek Hughey (Hughey Business Law), Kevin Klein (Klein Bussell) and Ed Lanquist (Patterson). The startup banks with Pinnacle Financial. Outside accountants have not yet been required, said Fox. Fox and wife Carrington Fox have three sons, age 11 to 14. In addition to the founders' broad and intensive research efforts regarding existing news services for youthful adults, the CEO said his own sons have largely validated his view of the news appetite, global awareness and information-seeking behavior of youthful generations. Carrington Fox was until fairly recent a top-ranked restaurant reviewer for the Nashville Scene (Southcomm) and, according to her blog, she has completed work on a novel. She's a Princeton alumna with a Vanderbilt Owen Graduate School of Management MBA.